A cat microchip is implanted through a syringe that injects it underneath the skin. Although there is no universally agreed upon location, a cat microchip is usually implanted between the shoulder blades. At approximately 12mm long, it is about the same size as a grain of rice. Implanting a cat microchip only takes a few seconds, and will last for the rest of your cat's life. It is important to note that side effects have occurred in a very small portion of cats, and are considered very rare compared to the tens of millions of cats who have received microchips. When it comes to microchips, the potential benefits far outweigh the potential risks. Every year, we scan dozens of pets with inaccurate or outdated microchip information. PLEASE make sure to update your pet's microchip information each time you move or your phone number or other contact information changes. A microchip is virtually useless if you do not keep your contact information up to date, as the finder will be unable to contact you to reunite you with your lost pet if your contact information is outdated. 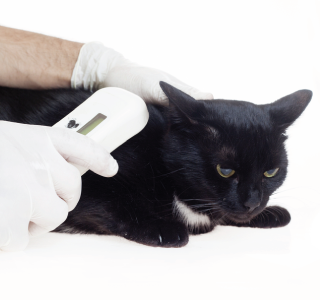 Most animal shelters and veterinary hospitals in the United States has a RFID device to detect a microchip for cats. However, there are various cat microchip manufacturers, and because of this not all RFID scanners can detect every microchip for cats. Therefore, shelters and veterinarians may keep several different scanners on-hand to detect different cat microchip brands. Since cat microchips can migrate, it is a good idea to ask your veterinarian during each checkup to scan the pet microchip to make sure it is still reading, and is also still located where it should be. If you are ready to schedule an appointment for cat microchipping services, please contact us today. Many people opt to have their pet microchipped at the time of spay or neuter, which is a great idea. Our staff would be happy to help you register your feline friend with the pet recovery service database. Schedule a microchipping appointment today!